Maybe I’m getting better, but more likely I just got lucky. Either way, I called this last pattern change pretty close. 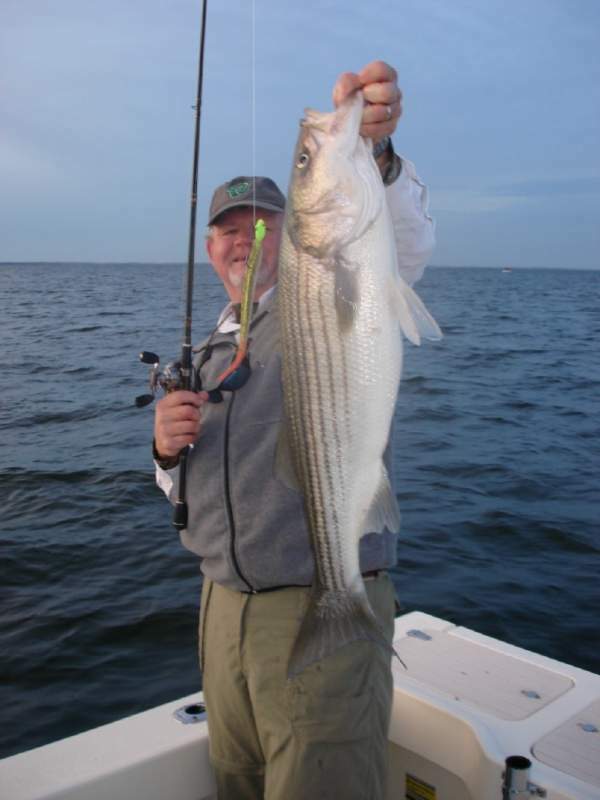 As the water cools, big fish move closer to the main channel of the Chesapeake Bay. There’s still plenty of smaller fish in the rivers and the nearby flats, but since it’s late November and the season for trophies, it’s time to lock in on the channel. Here are two good reasons: Number one – water temperature. 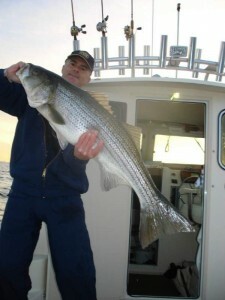 Striped bass prefer water that is warmer than 50 degrees. Surface temperatures right now in most of the Maryland section of the Chesapeake Bay are in the low 50s. Since the deeper water near the channel can be ten degrees warmer than it is in the rivers, stripers will stay closer to their comfort zone. You’ll see them holding very close to the bottom on the fish finder. They will still move up shallow to eat, but they’ll go right back to the deeper water to rest between feeding frenzies. The second reason to fish near the channel is bait. Larger fish want bigger bait. The most common baitfish of any consequence in the Bay right now is menhaden. Since they migrate toward warmer water just like rockfish, by late November they are well on their way toward their comfort zones farther south. That means there is less and less bait in the upper reaches of the Bay and the biggest concentrations of menhaden are now near the channel. That’s perfect conditions for big stripers because they can hang out in the deeper warmer water and still ambush big bait. That doesn’t mean they’ll bite anything you throw at them though. Well, maybe the smaller fish will, but there’s a secret to getting the trophies. Have you wondered why a few light tackle fishermen seem to consistently catch big fish when most are jigging up twenty inchers? There is surely a combination of reasons but one of the most important is that these fishermen know how to climb the ladder up to the biggest productive lure. It’s possible to go to lures that are too big, but the better anglers find the sweet spot with lures that weed out the smaller fish and attract the really big ones. That usually means matching, or slightly increasing the size of the available bait. If the bait is in the five to eight inch range – as it usually is in November – I’ll start with ten inch lures and work up. 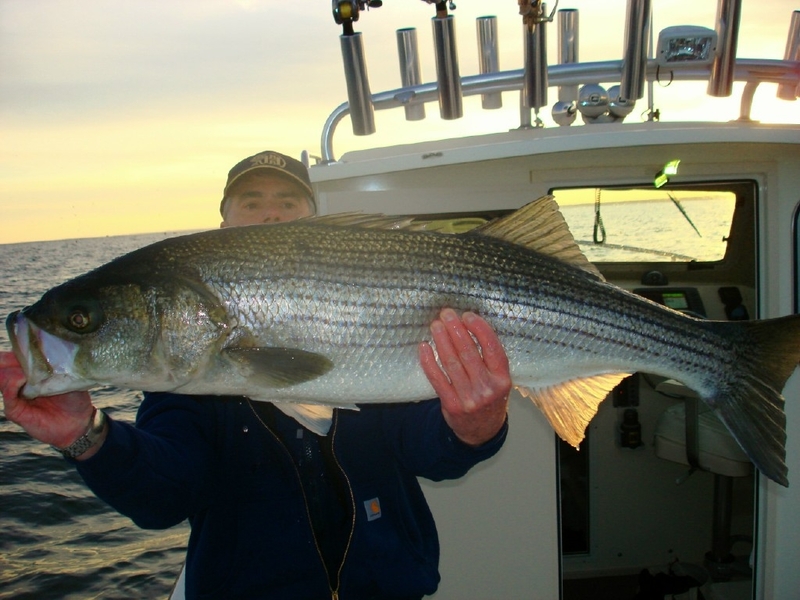 Big stripers don’t want to exert any more energy than possible. Cooler water increases their need to for feeding efficiency. A big tasty-looking target is hard for them to resist. Any flash and dash I can add to the lures such as alternating colors on the jigheads and scented dyes will help attract their attention. Thunder Road is in the shop for some electronics work, so I talked my Kent Island neighbor Mark into going out late this afternoon on his Parker Fischadler II. When I called him at noon, winds were blowing 20 knots and he didn’t want anything to do with it. I wore him down by suggesting we’d stay close to home and predicting the wind would come down. It did so we headed out about two hours before dark. We passed several huge flocks of small birds on the way to where we hoped the fish would be. Small gulls mean glass minnows and bay anchovies. There will be plenty of fish under them, but they’ll all be little. We found big birds flying high over the channel edge right where we hoped they would be. As in our previous trip, if we had been keeping fish we would’ve had a limit within five minutes of when we started fishing, but we carefully released everything that came on board tonight. I led off with a couple of over-thirties on a ten inch purple glitter BKD hotrodded with chartreuse garlic dye on a one ounce candy corn jig head. Mark was catching plenty of mid twenty inch fish, but couldn’t break into overs. That all changed when he moved up to a hotrodded ten inch blue glitter Fin-S Fish. Fin-S lures are slightly wider than BKDs so they show a wider profile in the water. I get more strikes and catch more fish on BKDs, but we sometimes get some nice fish on the Fin-S Fish when the bait is a little bigger than usual. I looked over to see Mark’s rod dipping violently so I figured he had on a good fish. I reluctantly put my outfit in a rodholder and stepped out onto the swim platform to help him land it. We usually don’t measure fish, so I estimated this one at 38 inches when it came onboard. I’m usually pretty good at guessing lengths and weights, but boy was I wrong. He has a ruler attached to the toe-rail on his boat so we put the big fish down and measured it. I missed it by a full four inches. I wonder know how many of the previous “thirty-eight inchers” we caught this year might have been over forties? It’s a benchmark I don’t want to underestimate because it’s the qualifying mark for a Maryland Fishing Challenge entry. This fish will get Mark free family tickets to the Maryland Seafood Festival next fall and qualify him for a chance to win money and prizes. Good one! We finished the night with several more mid to high thirty inch long fish. It turned out to be a good couple of hours. I won’t be fishing over the holiday weekend, but I hope to be back in the swing of things in the early mornings or late evenings of next week. I’ll still be locked on to the channel edges looking for big birds and big bait. Let’s hope those heavy fish don’t get too full on Turkey Day and head off out of the Bay. 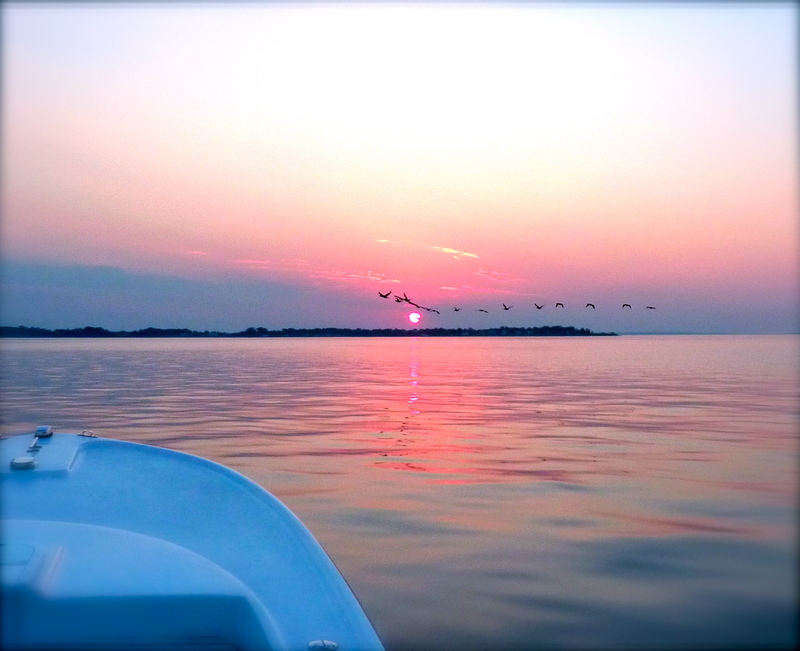 I’ll close with a shot I took of Canadian geese at the mouth of the Chester River last weekend. The Chesapeake is a beautiful place in November. Happy Thanksgiving from Chesapeake Light Tackle! Good stuff, Shawn. We’re on a patch of fish on deep flats next to channel edges in the Severn that are small by Bay standards but great for the river–18-29″, punctuated by huge perch that will sometimes take a 5″ Gulp! Alive tail but are more likely to bite feather jigs. The rock are all full of 5-6″ bunkers that show up well on the SturctureScan. Hope Thunder Road gets her wires straight soon. It was mighty chilly out there this morning, but we had constant action. The hot rockfish bait the last two days has been a Glow/Fl. Green 5″ BA on a 3/4-1-oz. head, provided by Dr. Neil McGarvey of Arnold Professional Pharmacy, who was High Rod Tuesday morning before work. Thanks for another great article Shawn. As my confidence in LTJ increases, my motivation for trolling decreases steadily. A couple of buddies and I have been working to find those bigger fish to jig on in the PNP/PLO area this fall. Hope we can post a good TF report after the weekend! Keep the articles coming, they’re all packed with great information. Great article Shawn, Happy Thanksgiving! thanks for giving so much to teach others. I learn more and become a better fisherman everytime I read CLT. This article is very helpful to me even though I can’t fish much more this year. At least now I have an idea of wher to look. Thank you and Happy Thanksgiving. 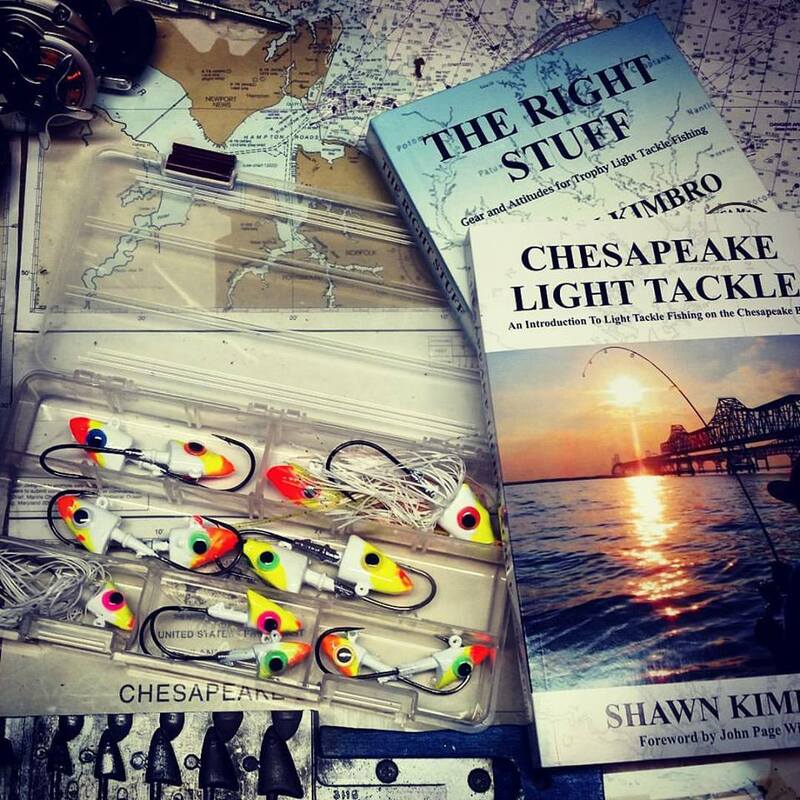 Thanks for a good entertaining and educational read, and thanks for helping me with my fish finder. Those are Canada geese. Cool photo! Great website! They were drinking LaBatt and called me a hoser, so I figure they were from Canada, eh? Well excuse me. I didn’t know the full story of those Canadian geese! I Love the fall season,many changes going on out there .Cool geese photo Shawn and that big fish your buddy caught aint bad either. Wish I could have done some fishing before this front went through,not sure what to expect after.Lets hope there is still some good fishing. What separates success from failure is often a direct result of the amount of time spent on the water. Today was a perfect example. Against my better judgment, we went out in rough conditions just to check out several locations. There was nobody else out there and for good reason. You’ll never see a report from trips like this, but they are part of the reason for having continued success in catching big fish. Oh yea, that and having a false bottom flask. Awesome! All the lakes here iced over just before deer season closed. Bass will have to wait until spring. It is now officially open season on libations. Shawn, I fish alot in Pocomoke Sound. When you caught the big fish you spoke of, did you see those fish on the sonar? You said thier were big birds, were they over big bait? Were you blind jigging (not seeing big fish marks)? This past week we got on some big fish on a big underwater point. I was marking what I though were individul fish, that I most likley would have over looked had not been for the new stucture scan I just installed. We were throwing 6″ BKDs. We alsocaught a 40-46 & 32″ around smaller fish under birds.